As a history graduate I have always been interested in primary sources for research and archival work in relation to art, films and popular culture. 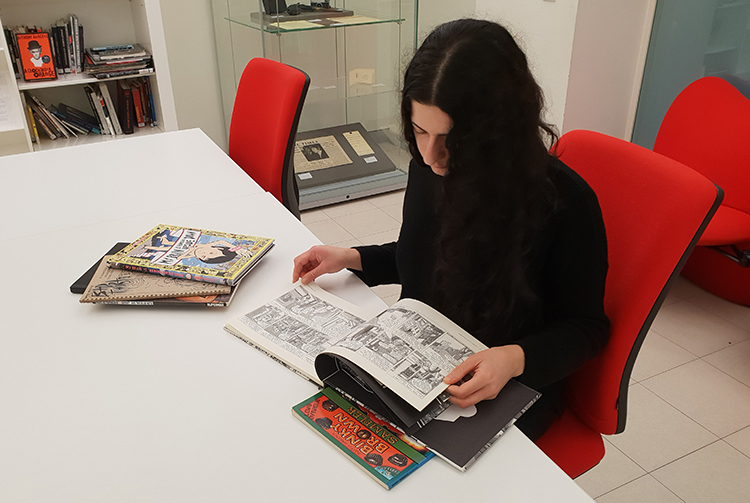 I wanted to gain experience in the inner workings of an archive and to understand better the archivists’ mission to preserve and to render artefacts accessible to researchers and the general public. I have been a volunteer at the Archives and Special Collections Centre at London College of Communication for the past three months. It has been a real learning experience as under the supervision of the archivists I have been able to assist in their work and learn a lot in the process. On my first day of volunteering I was shown around the Archive and introduced to its mission and activities and encouraged to use it for my own research purposes and interests. I was also encouraged to get involved directly with the cataloguing and arranging of the collections. I have box-listed the archive of musician Lindsay Cooper and also organised, catalogued and re-boxed the Andrew McSteen comic book collection which is now available for the public to see. The collection holds titles including the Dandy and Beano, Superman and Batman, with issues ranging from the mid-1970s until the early 2000s. The opportunity to acquire hands on experience with primary sources and private documents has been very touching and educational. For example the contact with the writings and life archive of musician Lindsay Cooper has been an emotional experience. Lindsay died in 2013 at the age of 62 from Multiple Sclerosis and her archive is a testimony to her prolific work, talent and life. Lindsay was an acclaimed bassoon and oboe player as well as a composer and political activist. She is most well-known for her work with the experimental band Henry Cow. Her work transcended classical music to encompass progressive and avant-rock, experimental, contemporary classical and improvisation. She also founded and toured extensively with the Feminist Improvising Group. Her private archive consists of her compositions, work in progress and personal writings, diaries and notes. They all offer a glimpse into a creative life where music and daily life are interwoven. The archive of Lindsay Cooper will soon become available to students and the public.